The step between genres, more often than not, seems to be a precarious one for most artists. The choice of what the music gets the most of genrewise can either make an album phenomenally or break one equally phenomenally. Locrian’s Territories is a shining example of the former. Though firmly rooted in a black metal mentality, this lustrous album spans from black metal to power electronics to ambient to drone, all tastefully and masterfully accomplished. The sounds here are sweeping and expansive, giving ear to all the genres involved. The compositions here are painstakingly constructed; dense spaces created with captivating landscapes of sound dominate the album with nuances of droning resonances, hidden squalls, and feedback rising out of the mist. Procession of Ancient Brutalism is the first track to bring out the black metal side of Locrian on this album. 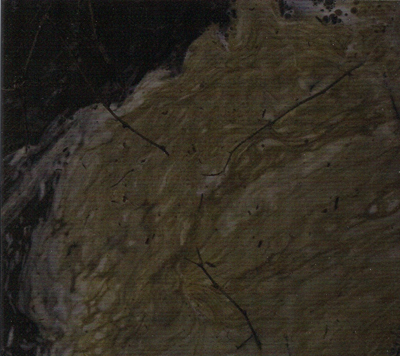 The entire track consists of a swirling miasma of blackened textures. The riffs are long, repetitive, and hypnotizing. Ring Road changes the tone even more with a harsh power electronics track, similar in style to Twodeadsluts Onegoodfuck. The track starts out harsh but slowly evolves into drone. Antediluvian Territory features some beautiful minimalistic guitar work and is highly evocative and enchanting. The Columnless Arcade finishes Territories off with more black metal but adds more of a progressive element and reminds me a lot of the instrumental band Russian Circles. The mentality on Territories is one of lo-fi black metal but with vigorous musicianship; Locrian does not at all rely too much on the black metal sound. Overall, Territories is very accessible but keeps a highly experimental feel. Every track is beautifully composed and the album as a whole retains a lot of unity, despite the major differences in genres.